Scorpion stings are a major public health problem in many underdeveloped tropical and subtropical countries, especially Sahelian Africa, South India, the Middle East, Mexico, and South Latin America. [1, 2] The estimated annual number of scorpion stings is 1.2 million leading to 3250 deaths (0.27%). For every person killed by a poisonous snake, 10 are killed by a poisonous scorpion. In Mexico, 1000 deaths from scorpion stings occur per year. In the United States, only 4 deaths in 11 years have occurred as a result of scorpion stings. Furthermore, scorpions can be found outside their normal range of distribution, that is when they crawl into luggage, boxes, containers, or shoes and are unwittingly transported home via human travelers. A scorpion has a flattened elongated body and can easily hide in cracks. It has 4 pairs of legs, a pair of claws, and a segmented tail that has a poisonous spike at the end. Scorpions vary in size from 1-20 cm in length. Centruroides limbatus, identified by Scott Stockwell, PhD. A small barb at the base of the stinger may be helpful in identifying Centruroides or Tityus species, although its presence is variable. Photo by Sean Bush, MD. 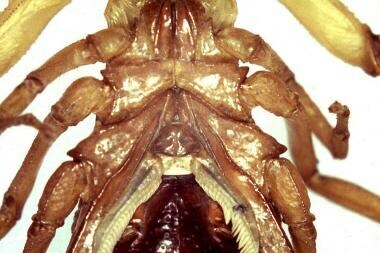 See Arthropod Envenomation: From Benign Bites to Serious Stings, a Critical Images slideshow, for help identifying and treating various envenomations. Out of 1500 scorpion species, 50 are dangerous to humans. Scorpion stings cause a wide range of conditions, from severe local skin reactions to neurologic, respiratory, and cardiovascular collapse. Envenomation from most scorpions results in a simple, painful, local reaction that can be treated with analgesics, antihistamines, and symptomatic/supportive care. This article focuses on scorpions that generally are considered more dangerous to humans. Almost all of these lethal scorpions, except the Hemiscorpius species, belong to the scorpion family called the Buthidae. The Buthidae family is characterized by a triangular-shaped sternum, as opposed to the pentagonal-shaped sternum found in the other 5 scorpion families. Scorpions from the family Buthidae (which includes almost all of the potentially lethal scorpions) generally can be identified by the triangular sternal plate. In other families of scorpions, this feature is more square or pentagonal. Photo by Sean Bush, MD. In addition to the triangular-shaped sternum, poisonous scorpions also tend to have weak-looking pincers, thin bodies, and thick tails, as opposed to the strong heavy pincers, thick bodies, and thin tails seen in nonlethal scorpions. Centruroides species. Note the slender pincers generally characteristic of scorpions from the family Buthidae. Photo by Sean Bush, MD. Centruroides - Southern United States, Mexico, Central America, and the Caribbean (Centruroides exilicauda is found in the Baja California peninsula of Mexico and Centruroides sculpturatus is found in the state of Sonora, Mexico and the southwestern United States, primarily Arizona and small parts of Utah, New Mexico, Nevada, and California.) The accepted taxonomy of the bark scorpion has changed over time. Either C exilicauda or C sculpturatus have been accepted at various times. However, recent evidence from biochemical, genetic, and physiologic characterization of their venom suggests that they are two different species as listed above. However, these scorpions may be found outside their natural habitat range of distribution when inadvertently transported with luggage and cargo. In general, scorpions are not aggressive. They are ambush predators, often hiding and waiting for their prey. Scorpions are nocturnal creatures; they hunt during the night and hide in crevices and burrows during the day to avoid the light. Thus, accidental human stinging occurs when scorpions are touched while in their hiding places, with most of the stings occurring on the hands and feet. Scorpions use their pincers to grasp their prey; then, they arch their tail over their body to drive their stinger into the prey to inject their venom, sometimes more than once. The scorpion can voluntarily regulate how much venom to inject with each sting. The striated muscles in the stinger allow regulation of the amount of venom ejected, which is usually 0.1-0.6 mg. If the entire supply of venom is used, several days must elapse before the supply is replenished. Furthermore, scorpions with large venom sacs, such as the Parabuthus species, can even squirt their venom. The venom glands are located on the tail lateral to the tip of the stinger and are composed of 2 types of tall columnar cells. One type produces the toxins, while the other produces mucus. The potency of the venom varies with the species, with some producing only a mild flu and others producing death within an hour. In addition, there is species variability in venom volume, flow rate, and duration. Generally, the venom is distributed rapidly into the tissue if it is deposited into a venous structure. Venom deposited via the intravenous route can cause symptoms only 4-7 minutes after the injection, with a peak tissue concentration in 30 minutes and an overall toxin elimination half-life of 4.2-13.4 hours through the urine. The more rapidly the venom enters the bloodstream, the higher the venom concentration in the blood and the more rapid the onset of systemic symptoms. Scorpion venom is a water-soluble, antigenic, heterogenous mixture, as demonstrated on electrophoresis studies. This heterogeneity accounts for the variable patient reactions to the scorpion sting. However, the closer the phylogenetic relationship between the scorpions, the more similar the immunological properties. Furthermore, the various constituents of the venom may act directly or indirectly and individually or synergistically to manifest their effects. In addition, differences in the amino acid sequence of each toxin account for their differences in the function and immunology. Thus, any modifications of the amino acid sequence result in modification of the function and immunology of the toxin. Scorpion venom may contain multiple toxins and other compounds. The venom is composed of varying concentrations of neurotoxin, cardiotoxin, nephrotoxin, hemolytic toxin, phosphodiesterases, phospholipases, hyaluronidases, glycosaminoglycans, histamine, serotonin, tryptophan, and cytokine releasers. The most important clinical effects of envenomation are neuromuscular, neuroautonomic, or local tissue effects. The primary targets of scorpion venom are voltage-dependent ion channels, of which sodium channels are the best studied. Venom toxins alter these channels, leading to prolonged neuronal activity. Many end-organ effects are secondary to this excessive excitation. Autonomic excitation leads to cardiopulmonary effects observed after some scorpion envenomations. Somatic and cranial nerve hyperactivity results from neuromuscular overstimulation. Additionally, serotonin may be found in scorpion venom and is thought to contribute to the pain associated with scorpion envenomation. The most potent toxin is the neurotoxin, of which two classes exist. Both types of neurotoxin are heat-stable, have low molecular weight, and are responsible for causing cell impairment in nerves, muscles, and the heart by altering ion channel permeability. The long-chain polypeptide neurotoxin causes stabilization of voltage-dependent sodium channels in the open position, leading to continuous, prolonged, repetitive firing of the somatic, sympathetic, and parasympathetic neurons. This repetitive firing results in autonomic and neuromuscular overexcitation symptoms, and it prevents normal nerve impulse transmissions. Furthermore, it results in release of excessive neurotransmitters such as epinephrine, norepinephrine, acetylcholine, glutamate, and aspartate. Meanwhile, the short polypeptide neurotoxin blocks the potassium channels. The binding of these neurotoxins to the host is reversible, but different neurotoxins have different affinities. The stability of the neurotoxin is due to the 4 disulfide bridges that fold the neurotoxin into a very compact 3-dimensional structure, thus making it resistant to pH and temperature changes. However, reagents that can break the disulfide bridges can inactivate this toxin by causing it to unfold. Also, the antigenicity of this toxin is dependent on the length and number of exposed regions that are sticking out of the 3-dimensional structure. The causes of scorpion envenomation are primarily accidental. Scorpions are shy creatures and only sting if threatened, cornered, or disturbed (eg, being sat or stepped upon). Curious individuals are at risk because of increased interaction with the scorpion. Generally, most lethal scorpions have an LD50 below 1.5 mg/kg. Milking the venom gland produces approximately a 4-fold increase in yield amount compared to electrical excitation. Approximately 16,000 stings have been reported, with the majority being from the nonlethal scorpions. Only 1 of 30 scorpion species found in the United States is dangerous to humans. 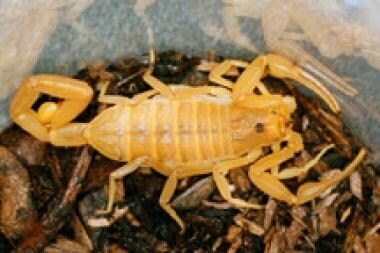 The neurotoxin-bearing and potentially lethal scorpion species in the United States is the Arizona bark scorpion in the genus Centruroides. Less than 1% of stings from Centruroides are lethal to adults; however, 25% of children younger than 5 years who are stung die if not treated. The epidemiological features of a patient who has been envenomed show a disposition for rural areas (59.6-73%), with most of the stings occurring in the summer months between 6:00 pm and 12:00 am (49%) and a second peak from 6:00 am to 12:00 pm (30%). Both of these peaks coincide maximum human activity with maximum scorpion activity. In addition, nocturnal envenomations are slightly more common than diurnal, as the scorpion is more active at night. Furthermore, the larger the scorpion population, the larger the incidence rate. Because the offending scorpion is recovered for identification in only 30% of the cases, local knowledge of the type of scorpion populating the area is useful. The 2016 Annual Report of the American Association of Poison Control Centers' National Poison Data System (NPDS) reported 13,670 case mentions for scorpion envenomations, with 22 "major" outcomes and 0 deaths. However, because of underreporting, this is probably an underestimation of the true number of stings. Scorpion stings occur in temperate and tropical regions, especially between the latitudes of 50°N and 50°S of the equator. Furthermore, stings predominantly occur during the summer and evening times. In addition, the majority of patients are stung outside their home. Females may be more susceptible than males to the same amount of scorpion venom because of their lower body weight. Adults, especially those of workforce age, are stung more often than children. However, children are more likely to develop a more rapid progression of symptoms after a scorpion sting, with increased severity and higher mortality because of their lower body weight,  with a global rate of 10 deaths per 1000 cases in children. [10, 11] Furthermore, elderly persons are more susceptible to stings because of their decreased physiologic reserves and increased debilitation. Accurate worldwide data are not available. Scorpion stings are underreported because many envenomations occur in sparsely populated areas with little public health and medical infrastructure. Furthermore, reporting is generally not required. Most deaths occur during the first 24 hours after the sting and are secondary to respiratory or cardiovascular failure. Children and elderly persons are at the greatest risk for morbidity and mortality. A smaller child, a lower body weight, and a larger ratio of venom to body weight lead to a more severe reaction. A mortality rate of 20% is reported in untreated babies, 10% in untreated school-aged children, and 1% in untreated adults, but these rates vary across years and regions. In terms of venom lethality, the venom of Androctonus australis and Leiurus quinquestriatus are the most toxic. C sculpturatus venom is low in toxicity compared with most scorpions of medical importance. Prognosis is dependent on many factors, including species of scorpion, patient health, and access to medical care. Most patients recover fully after scorpion envenomation. Symptoms generally persist for 10-48 hours. If the victim survives the first few hours without severe cardiorespiratory or neurologic symptoms, the prognosis is usually good. Furthermore, surviving the first 24 hours after a scorpion sting also carries a good prognosis. Khatony A, Abdi A, Fatahpour T, Towhidi F. The epidemiology of scorpion stings in tropical areas of Kermanshah province, Iran, during 2008 and 2009. J Venom Anim Toxins Incl Trop Dis. 2015. 21:45. [Medline]. Queiroz AM, Sampaio VS, Mendonça I, Fé NF, Sachett J, Ferreira LC, et al. Severity of Scorpion Stings in the Western Brazilian Amazon: A Case-Control Study. PLoS One. 2015. 10 (6):e0128819. [Medline]. Chippaux JP, Goyffon M. Epidemiology of scorpionism: a global appraisal. Acta Trop. 2008 Aug. 107 (2):71-9. [Medline]. van der Meijden A, Coelho P, Rasko M. Variability in venom volume, flow rate and duration in defensive stings of five scorpion species. Toxicon. 2015 Jun 15. 100:60-6. [Medline]. Safford MM. Arizona Bark Scorpion. US National Park Service. Available at https://www.nps.gov/articles/bark-scorpion.htm. February 1, 2017; Accessed: November 28, 2017. Jahan S, Mohammed Al Saigul A, Abdul Rahim Hamed S. Scorpion stings in Qassim, Saudi Arabia--a 5-year surveillance report. Toxicon. 2007 Aug. 50(2):302-5. [Medline]. Shahbazzadeh D, Amirkhani A, Djadid ND, Bigdeli S, Akbari A, Ahari H. Epidemiological and clinical survey of scorpionism in Khuzestan province, Iran. Toxicon. 2009 Mar 15. 53(4):454-9. [Medline]. Dehghankhalili M, Mobaraki H, Akbarzadeh A, Yazdani R, Nazemi A, Ghaffarpasand F, et al. Clinical and Laboratory Characteristics of Pediatric Scorpion Stings: A Report From Southern Iran. Pediatr Emerg Care. 2015 Nov 2. [Medline]. Bosnak M, Ece A, Yolbas I, Bosnak V, Kaplan M, Gurkan F. Scorpion sting envenomation in children in southeast Turkey. Wilderness Environ Med. 2009 Summer. 20(2):118-24. [Medline]. Ulug M, Yaman Y, Yapici F, Can-Ulug N. Scorpion envenomation in children: an analysis of 99 cases. Turk J Pediatr. 2012 Mar-Apr. 54(2):119-27. [Medline]. Langley RL, Morrow WE. Deaths resulting from animal attacks in the United States. Wilderness Environ Med. 1997 Feb. 8(1):8-16. [Medline]. Boyer L, Heubner K, McNally J, Buchanan P. Death from Centruroides scorpion sting allergy [abstract]. J Toxicol Clin Toxicol. 2001. 39:561-562. Bawaskar HS, Bawaskar PH. Scorpion sting: update. J Assoc Physicians India. 2012 Jan. 60:46-55. [Medline]. Skolnik AB, Ewald MB. Pediatric scorpion envenomation in the United States: morbidity, mortality, and therapeutic innovations. Pediatr Emerg Care. 2013 Jan. 29(1):98-103; quiz 104-5. [Medline]. Bouaziz M, Bahloul M, Kallel H, Samet M, Ksibi H, Dammak H, et al. Epidemiological, clinical characteristics and outcome of severe scorpion envenomation in South Tunisia: multivariate analysis of 951 cases. Toxicon. 2008 Dec 15. 52(8):918-26. [Medline]. Prasad R, Mishra OP, Pandey N, Singh TB. Scorpion sting envenomation in children: factors affecting the outcome. Indian J Pediatr. 2011 May. 78(5):544-8. [Medline]. Guerra CM, Carvalho LF, Colosimo EA, Freire HB. Analysis of variables related to fatal outcomes of scorpion envenomation in children and adolescents in the state of Minas Gerais, Brazil, from 2001 to 2005. J Pediatr (Rio J). 2008 Nov-Dec. 84(6):509-15. [Medline]. Parma JA, Palladino CM. [Scorpion envenomation in Argentina]. Arch Argent Pediatr. 2010 Apr. 108(2):161-7. [Medline]. Freire-Maia L, Pinto GI, Franco I. Mechanism of the cardiovascular effects produced by purified scorpion toxin in the rat. J Pharmacol Exp Ther. 1974 Jan. 188(1):207-13. [Medline]. Pinto MC, Borboleta LR, Melo MB, Labarrére CR, Melo MM. Tityus fasciolatus envenomation induced cardio-respiratory alterations in rats. Toxicon. 2010 Jun 1. 55(6):1132-7. [Medline]. Bahloul M, Chaari A, Dammak H, Samet M, Chtara K, Chelly H, et al. Pulmonary edema following scorpion envenomation: mechanisms, clinical manifestations, diagnosis and treatment. Int J Cardiol. 2013 Jan 10. 162(2):86-91. [Medline]. Bawaskar HS. Diagnostic cardiac premonitory signs and symptoms of red scorpion sting. Lancet. 1982 Mar 6. 1(8271):552-4. [Medline]. Kaplanoglu M, Helvaci MR. Scorpion stings in pregnant women: an analysis of 11 cases and review of literature. Clin Exp Obstet Gynecol. 2015. 42 (2):228-30. [Medline]. Tan HH, Mong R. Scorpion stings presenting to an emergency department in Singapore with special reference to Isometrus maculatus. Wilderness Environ Med. 2013 Mar. 24(1):42-7. [Medline]. Abroug F, Souheil E, Ouanes I, Dachraoui F, Fekih-Hassen M, Ouanes Besbes L. Scorpion-related cardiomyopathy: Clinical characteristics, pathophysiology, and treatment. Clin Toxicol (Phila). 2015 Jul. 53 (6):511-8. [Medline]. Sundararaman T, Olithselvan M, Sethuraman KR, Narayan KA. Scorpion envenomation as a risk factor for development of dilated cardiomyopathy. J Assoc Physicians India. 1999 Nov. 47(11):1047-50. [Medline]. Bhoite RR, Bhoite GR, Bagdure DN, Bawaskar HS. Anaphylaxis to scorpion antivenin and its management following envenomation by Indian red scorpion, Mesobuthus tamulus. Indian J Crit Care Med. 2015 Sep. 19 (9):547-9. [Medline]. Hammoudi-Triki D, Ferquel E, Robbe-Vincent A, Bon C, Choumet V, Laraba-Djebari F. Epidemiological data, clinical admission gradation and biological quantification by ELISA of scorpion envenomations in Algeria: effect of immunotherapy. Trans R Soc Trop Med Hyg. 2004 Apr. 98 (4):240-50. [Medline]. Figueiredo AB, Cupo P, Pintya AO, Caligaris F, Marin-Neto JA, Hering SE. [Assessment of myocardial perfusion and function in victims of scorpion envenomation using gated-SPECT]. Arq Bras Cardiol. 2010 Apr. 94(4):444-51. [Medline]. Nouira S, Boukef R, Nciri N, Haguiga H, Elatrous S, Besbes L, et al. A clinical score predicting the need for hospitalization in scorpion envenomation. Am J Emerg Med. 2007 May. 25 (4):414-9. [Medline]. Balit CR, Harvey MS, Waldock JM, Isbister GK. Prospective study of centipede bites in Australia. J Toxicol Clin Toxicol. 2004. 42 (1):41-8. [Medline]. Chaou CH, Chen CK, Chen JC, Chiu TF, Lin CC. Comparisons of ice packs, hot water immersion, and analgesia injection for the treatment of centipede envenomations in Taiwan. Clin Toxicol (Phila). 2009 Aug. 47 (7):659-62. [Medline]. Aksel G, Güler S, Doğan NÖ, Çorbacioğlu ŞK. A randomized trial comparing intravenous paracetamol, topical lidocaine, and ice application for treatment of pain associated with scorpion stings. Hum Exp Toxicol. 2015 Jun. 34 (6):662-7. [Medline]. Chippaux JP. Emerging options for the management of scorpion stings. Drug Des Devel Ther. 2012. 6:165-73. [Medline]. Boyer LV, Theodorou AA, Berg RA, et al. Antivenom for critically ill children with neurotoxicity from scorpion stings. N Engl J Med. 2009 May 14. 360(20):2090-8. [Medline]. [Full Text]. Natu VS, Kamerkar SB, Geeta K, Vidya K, Natu V, Sane S, et al. Efficacy of anti-scorpion venom serum over prazosin in the management of severe scorpion envenomation. J Postgrad Med. 2010 Oct-Dec. 56(4):275-80. [Medline]. Bawaskar HS, Bawaskar PH. Efficacy and safety of scorpion antivenom plus prazosin compared with prazosin alone for venomous scorpion (Mesobuthus tamulus) sting: randomised open label clinical trial. BMJ. 2011 Jan 5. 342:c7136. [Medline]. [Full Text]. Kumar CM, Prasad SV. Echocardiologic evaluation and follow-up of cardiovascular complications in children with scorpion sting in coastal South India. Indian J Crit Care Med. 2015 Jan. 19 (1):42-6. [Medline]. Kumar PM, Krishnamurthy S, Srinivasaraghavan R, Mahadevan S, Harichandrakumar KT. Predictors of Myocardial Dysfunction in Children with Indian Red Scorpion (Mesobuthus tamulus) Sting Envenomation. Indian Pediatr. 2015 Apr. 52 (4):297-301. [Medline]. Gupta BD, Parakh M, Purohit A. Management of scorpion sting: prazosin or dobutamine. J Trop Pediatr. 2010 Apr. 56(2):115-8. [Medline]. Patil SN. A retrospective analysis of a rural set up experience with special reference to dobutamine in prazosin-resistant scorpion sting cases. J Assoc Physicians India. 2009 Apr. 57:301-4. [Medline]. 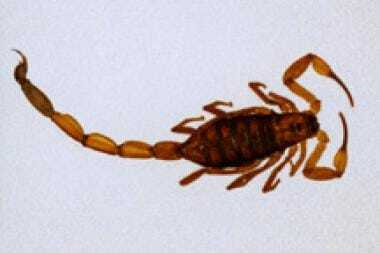 Centruroides (Scorpion) Immune F(ab’)2 (Equine). Prescribing information. Accessed August 9, 2011. [Full Text]. Disclosure: Received research grant from: BTG International Inc.